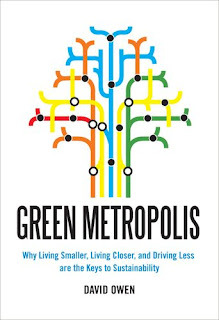 David Owen's Green Metropolis initially focuses on the author's move from the traffic and congestion of Manhattan to a presumed idyllic country setting in Connecticut to a 100-year old house across from a nature preserve. The move, which was supposed to be an effort to be more environmentally conscious, ended up being (in his own words) an ecological catastrophe. The Owen family's electricity consumption went from 4,000 kilowatt-hours to 30,000 kilowatt-hours. They went from zero to two cars shortly after the move and started driving instead of walking or bicycling for almost any activity away from home. This obvious change in their lifestyle led him to reexamine the premise of the big bad city and its atrocities against nature. Generally speaking, any place with lots of tall buildings and heavy traffic is considered an environmental disaster. Except that it is not. In fact, he goes on to make the case (quite successfully) that New York is the greenest city in the nation. For starters, let's clarify that green means environmentally sustainable and efficient in terms of fossil fuels usage. Green should not construe lush forests with gushing streams and mountain ranges. On a per capita basis, New York uses a limited amount of energy. The average New Yorker generates 7.1 metric tons of greenhouse gases compared to the national average of 24.5 MT. Manhattanites generate even less. So-called "eco-friendly" cities viz. Portland, OR and Boulder, CO pale in comparison. And it all boils down to to one key factor: population density. Manhattan's density is about 67,000 per sq. mile, which is over 800 times that of the nation. The sheer density sharply reduces the opportunities to be wasteful as well as possibilities for reckless consumption. Most of its inhabitants can get by without owning a car. Over 80% of employed Manhattan residents commute to work by either public transport, bicycle or foot. Most live in some of the most inherently energy-efficient residential structures i.e. apartments. The heat escaping one apartment helps heat the one above it, whereas most single family homes lose a portion of their heat through the roof. 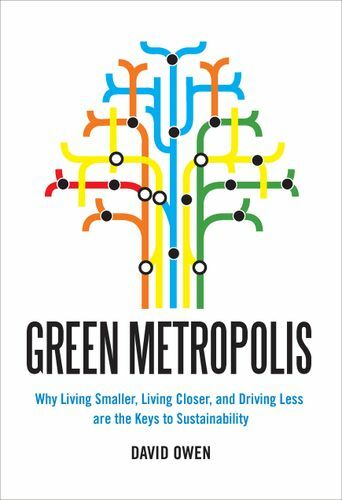 The book explores this novel approach to sustainability and notes that New York’s remarkable population density is not a result of conscientious planning but due to a series of serendipitous accidents. The foremost accident is the geographic location of Manhattan in particular. It is a seaport turned inside out – a city with a harbor around it rather than a harbor with a city along the edge. This drove all early development inward and upward. Another accident was that the street plan was designed by merchants interested in economic efficiency rather than in boulevards or empty spaces between buildings. A third accident was that residential and commercial development was more mixed in New York than what would be allowed later in most other parts of the US. The subsequent zoning laws in the US would not have allowed for such development. Also, by the early 1900s, most of Manhattan had already developed such that it was difficult to make changes to accommodate the automobile. Any meaningful discussion regarding the environment must ultimately be about fossil fuels, mainly oil. The book spends a good portion on the “oil culture” that has grasped civilization today. Everything we buy or do includes the cost of fossil fuels; even reading this blog, either electronically or on paper, would not be possible without fossil fuels (the computer, the power running the computer, the making of the paper, transportation and even the chair one is sitting on will have oil-based coatings; not to mention the eyewear used, if any). This is a very easy-to-read book on a subject deemed by some to be somewhat dry and cumbersome. Owen manages to start from a pin-point observation of New York City and then expands the scope to the rest of the world, especially emerging countries. There are certainly lessons for developing urban areas. While New York’s evolution was largely organic, spontaneous and accidental, we have the opportunity to replicate the benefits in other cities to come. There are innumerable bits of trivia scattered all over the book which provide insight and perspective viz. What is the threshold for public transit in a neighborhood? Seven dwellings per acre. With that or more, one can have enough passengers to support a reasonable frequency of service. To those that deem densely populated cities as environmental crisis zones, consider this: On a per square foot basis, New York City generates more greenhouse gases, uses more energy and produces more solid waste than any other comparable American region. On any map showing negative environmental impacts, Manhattan will stick out like a red dot amongst green surroundings. However, on a per capita basis, these statistics are completely reversed. Therein lies the rub. Once we change our way of thinking, a profound environmental truth reveals itself. Density is good… and green. After all, it comes down to how we think about different approaches. Henry Ford called the city a “ pestiferous growth” and thought of his cars as tools for liberating humanity. I wonder if he would reconsider that today.